Mexican portrait painter, Frida Kahlo, was an influential artist who combined traditional themes with a contemporary style and also helped to promote the role of women in the art world. Kahlo's family heritage was was rich in influence from Europe and her native Mexico. Her parents passed to her a combination of German, Spanish and indigenous Mexican ancestry which helped to shape this unique, highly creative individual. Frida's paintings were a combination of surrealism and naive art styles. As with many artists, she preferred not to be labelled in mainstream art movements, claiming to be more of a realist artist who merely depicted her own dreams. The bright colours of Kahlo's work are contemporary in feel, but actually take their influence from Mexican art. Art from this region has typically been bright and bold, particularly when compared to the subtlety of the European Renaissance and Baroque periods. Whilst being a characteristic of Mexican art in general, it may have been the influence of Diego Rivera's murals that further inspired a young Frida, upon first meeting this larger than life character. Frida Kahlo is just one of a number of famous female artists from the last few centuries. The likes of impressionist Mary Cassatt and modernist Georgia O'Keeffe plus Art Deco portrait painter, Tamara de Lempicka were at the forefront of inspiring future generations of women to enter the male-dominated art world. Frida was a strong willed Mexican woman. The other names mentioned here were also of strong personalities, it was the only way to succeed as a woman in a male-dominated industry. Despite experiencing a life more turbulent than most, the challenge seemed to bring the best out of this extraordinary character. She was as determined as she was creative. 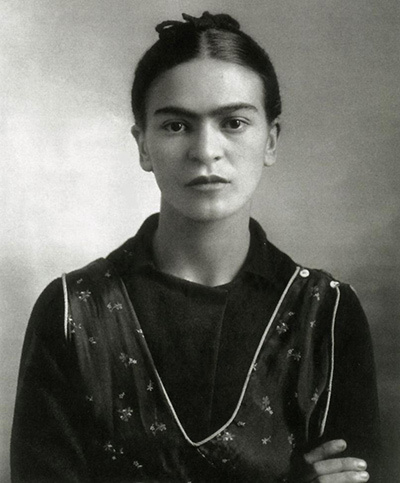 Kahlo produced countless self-portraits as a way of externalising her own inner turmoil. This is common for artists as a form of self expression. Vincent Van Gogh was famously depressive and his own self portraits captured a man who regularly introspected on himself. A young Frida's childhood was initially blighted by polio which she contracted aged six. This kept her separated for long periods, thus impacting her mental well being and self confidence. Early sports helped to bring this young lady out of her shell and from that point onwards, her personality was to remain bold and undaunted. Kahlo's next challenge to overcome was a serious motor accident which again left her bed ridden for sometime. Painting was to become her coping mechanism for these periods of isolation, and she quickly showed promise in this new interest. Self-Portrait in a Velvet Dress was her first completed artwork, an introspective piece which displays her own moods at this difficult time. Self portraits were to dominate her career from there on, as the artist constantly experimented with new twists around this same theme. Read more about her life in our Frida Kahlo biography. Two Fridas, for example, was a self Portrait where the artist captured herself in both traditional and more modern clothing. In other artworks, such as Self-Portrait with Thorn Necklace and Hummingbird, she would append personal objects that were important to her. Her pet monkey, Fulang-Chang frequently features alongside her.